In a project called Fine Dining – popular applications like Thunderbird, Chrome, Sophos Virus Removal Tool, Kaspersky TDSS Killer, McAfee Stinger, Skype, LibreOffice, Notepad++ are susceptible to dynamic link library (DLL) hijacking. Signal, WhatsApp, and others are seemingly in the cross hairs of the CIA, however there is no evidence that these apps are compromised; what the documents show is that the agency is capable of breaking into a range of devices including smartphones and tampering with their security libraries to bypass the encryption; once a device is pwned it’s pwned anyway so no surprise there. It's also possible to infer something of the theater of operations – for example the “Small Routers” document focuses on Routers in Pakistan and China, as well as routers popular in Amazon. No one should be shocked by all this - just look at the global reach of the CIA, and kudos to them for catching up with the times and investing in the right areas... What should be worrisome is that these toolsets are proliferating, increasingly used by governments to monitor citizens, and that more aggressive and invasive variations will result from either a release of the sources or even from clues in these documents. The average user has no way to know if they're compromised, and even sophisticated users will need to expend some effort to know; more technical details may come, but for now, how do you know if the CIA is watching you? You don't. This wikileak points to increasing erosion of public safety - despite having these tools at hand, world governments (US, UK, Germany) continue to push for encryption back doors. 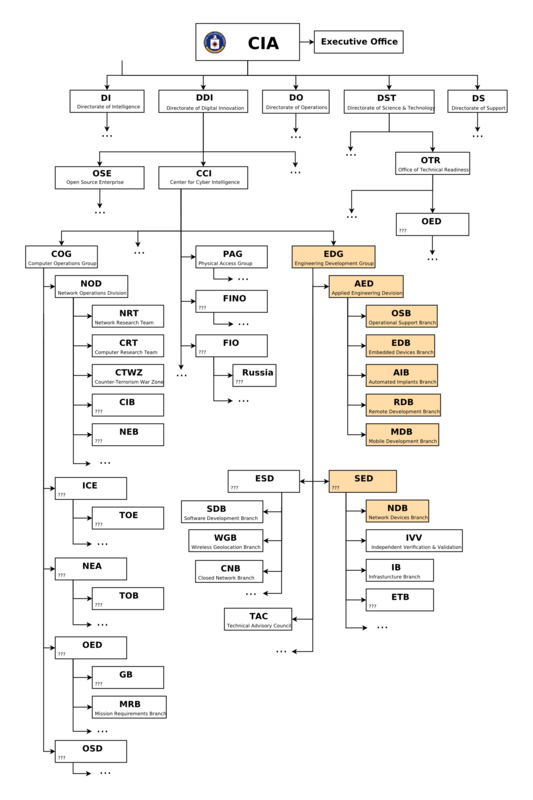 Equation Group’s leak (NSA) late 2016 and this latest CIA leak once again prove all organizations have their OpSec issues - the three letter agencies are themselves at risk; backdoors, once discovered, work just as well for foreign spies, cyber-criminals and script kiddies. Who is protecting the innocent? With this as backdrop and 5G on the horizon, one can visualize a world of unprecedented connectivity - self driving cars, IoT, connected medical devices, smart grid is here; impacting real human beings. Security must become part of the average person's mindset - what's the risk of adopting technology? what's the value of better security? Vote with your dollars, and vendors will have to re-prioritize. While this shift is in progress, it's likely to get worse before it gets better; people will start shying away from technology and wondering what their TV does with all the conversation it listens to. Thoughts on the Electronics Ban and How to Protect Your Privacy » « Who has my Data and Why?